Honestly, I’ve had this article open for probably at least 20 minutes and haven’t known where to start. It’s not because I don’t know what to say – rather the opposite. I have so much to say, but I don’t know what order to put it in. In case you didn’t get the reference of the title, Next to Normal is my favourite musical. Which to those of you who know the musical might partially explain my dilemma. Let’s just start at the beginning. I had recently got into Musical Theatre and came across the cast album on Spotify and immediately enjoyed it and could tell it was a heartbreaker but didn’t totally understand the big plot twist. One viewing of the musical later, I was in love. I had always been sympathetic towards mental illness and the portrayal of it in Next to Normal is absolutely heart wrenching and beautiful (I’ll go into some of the specifics later). As I said I’ve watched Next to Normal multiple times, but my first time watching it after I started struggling with my mental health hit home so hard. I can relate to so many things in it from both Dan and Diana. Let’s dive deeper into this musical and why I love it so much. Right away at the start of the show we kind of see an odd family dynamic. “Just Another Day” displays how everyone feels, and that all the characters feel off or have something wrong. I like this. It doesn’t only present Diana, who we find out later on as the one who’s suffering the show is based around. But we see that each member of the family has problems and things that feel wrong. Not only do they have problems but they’re all trying to cover them up as if things are normal. They’re literally trying to pretend that it’s “Just Another Day” and there is absolutely nothing wrong. This is something I think everyone, not only with mental illness tries to do, but anyone with any type of problem. We want to pretend it’s okay and cover it up. When people ask how we are we’re more inclined to say “fine” than to give an honest answer. No matter how much we’re suffering, or how hurt we are, we really do try to treat every day like it is just another day. There have been times where I’ve been hurting the most but there is no way anyone who looked at me would have been able to tell. The end of this song and Diana’s actions of making sandwiches on the floor give us our first hard look into Diana’s life. For those of you who aren’t as familiar with mental illness, Diana has Bipolar disorder. Simply put what this illness does is it will cause someone to cycle between depressive states and manic states. And in a manic state someone feels like they have all the energy in the world and it can also make them feel invincible and lead to dangerous behaviour. In this case Diana is making many sandwiches on the floor, while singing about wanting to be normal, and then she seems to realize what she’s down and how much she’s exerted herself by talking about the world is spinning. She wanted to do something for her family but being in a manic state still caused her issues. I also really feel this. Sometimes my illness causes me to do something, where I have the best intentions, or thought I was doing something good even, but wound up making a big mistake or hurting someone. It’s happened a couple times where I wasn’t aware what I was doing and did the wrong thing. Not that Diana making sandwiches inherently hurt someone but she also came to the realization that she wasn’t doing something entirely right either. What’s going on with Diana becomes even more clear when she visits her psychopharmacologist. As they discuss her medication. However, we’re going to jump back to this in a minute. I want to jump now to what’s going on with Dan. Who's crazy, the husband or wife? Believing that somehow things aren't as bizarre as they are? Who's crazy, the one who can't cope? Or maybe, the one who'll still hope? The one who sees doctors or the one who just waits in the car? This is how Dan opens the song and it’s really our first real look into what’s going on inside his head. He knows his wife is sick. He wants to help, but it’s clear he doesn’t totally understand. On top of that he’s also still trying to process his own hurt (more on this later). He’s supportive but he waits in the car. He wants to help but he doesn’t know how. The questions Dan is asking here are ones that people or loved ones with mental health ask often. They can see something is wrong but they can’t totally comprehend it. Heck, even I ask myself these questions. I know I have chronic depression. I know I have multiple forms of anxiety. And yet it’s still hard to wrap your mind around. It’s hard to acknowledge you’re actually sick. It’s hard to acknowledge your illness is real and it’s hard to acknowledge it isn’t something you or your loved one won’t be able to just snap out of. There are always so many questions around mental illness and one of the best things you can do for someone who suffers is to show them patience. Going back to Diana, now we see a multiple week stint of getting her to try different medications. This I feel is somewhat more common knowledge. As Diana says herself in the show medications aren’t an exact science and this is something I am also going through myself right now as I recently had my medications quit working. Adjusting and figuring out medication combos can be tired, exhausting work. Eventually we see Diana just go numb and give up on her medications in “I Miss the Mountains” which is also another super relatable song for anyone struggling. You want your life back. You want to be how things were. But you can’t. You’re sick. You need help. But you miss how you were. It’s a really tough feeling to deal with. Even though my “normal self” even not being Bipolar would still hit extreme highs and the bad lows… as far as I knew I was healthy, hurting a bit maybe but healthy. There comes a longing for your old self and who you were before the illness. Diana here is also talking about the highs. Those highs aren’t good for someone with Bipolar, but at the same time there is nothing worse than numbness. I’ve had that a few times and going numb is the absolute worst feeling in the world. Now comes the scene that makes everyone cry. When we realize that Diana’s son Gabe isn’t there and Diana has been hallucinating him this entire time. I really can’t comment on this as I am not a parent but I can’t even imagine that heartache that’s involved in losing a child. 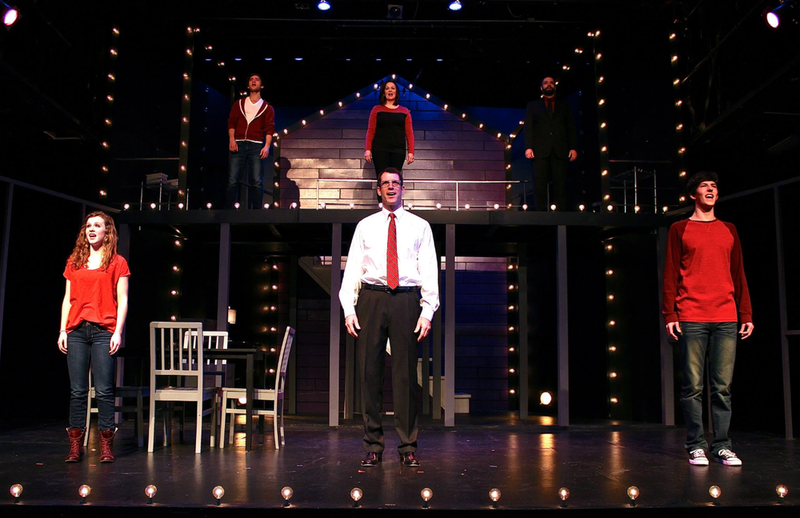 However, one thing I will comment on is the use of Gabe in Next to Normal. Throughout the entire musical even when Gabe’s ghost isn’t directly a part of the scene Gabe can often be seen lurking in the background. He’s a constant reminder as to what’s going on in the family. He doesn’t just follow Diana around either. He follows around Dan and Natalie as well. He’s a constant reminder of both what happened, and Diana’s illness. It’s a constant burden on the family. While it isn’t totally the same but quite often my mental illness makes me seem like a burden. Like Gabe in the show, it is constantly lurking in the background. Even when things are okay it’s always there in the background. A reminder. A sense that something is still off even when there is no reason to be off. And something that can affect your relationships. As I said we see Gabe and the illness following around the other family members and nowhere else do we see it to the same extent as “Superboy and the Invisible Girl.” We see the toll it has taken on Natalie; she feels alone, lost, and neglected. It’s one of the many negative things mental illness can do. Both to the person suffering and their loved ones. This song is also great because of the irony it uses. Natalie is singing about her and Gabe as if she is the one who is a ghost, and he’s real. At least in Diana’s eyes. We see more of Gabe’s presence in the family in “I’m Alive”, once again affirming what his continued presence, and Diana’s illness, does to the family. Diana gives one last chance to let him go. However, she unfortunately sees him and lets him lead her away into a suicide attempt. I love this scene from a mental health perspective despite how heart breaking it is. When you hear about suicide, some people are still of the notion that “it’s their fault” or “they could have avoided it.” However, this so clearly illustrates that when a person goes into a suicide attempt their mind is not in the right place. They aren’t thinking like the people on the outside looking in are thinking, as we see here with Diana. When someone gets that desperate and lonely, they aren’t thinking straight. Now we come to one of the most heartbreaking moments of the show for me. Dan’s solo song “I’ve Been” We saw bits of Dan’s suffering in his part in the past but “I’ve Been” brings it out even more. Diana just made her suicide attempt and Dan is reeling. We see his pain, the emotion, and for the first time we really see how much Dan is suffering almost as much as Diana. Then comes the heartbreaking piece where he says his is just a slower suicide. He might not be actively doing things like Diana was, but Dan is really hurting. Badly. As someone with mental illness I can relate to a lot of this. Not that I know someone who’s made an attempt but a lot of the feelings Dan expresses here are relevant. There’s times where I need that boost or lift he talks about but at the same time I have no one around. It’s so much thoughts and feelings he has that have all been bottled and pent up. Which is also something myself and a lot of people deal with. There are so many different things I have dealt with over time that even though I’m not getting help a lot of things still haven’t been touched. It’s a process, it takes time, and for the first time we see Dan acknowledges his hurt, and just how deep it goes. He’s always had Diana but now that she made an attempt on her life and needs treatment, he himself has to think about some of this own pain as well. As for the line about it being a slower suicide. While Dan isn’t trying to actively end his life or didn’t do something like Diana just tried it is possible to be passively suicidal. There comes a point where a person while they might not go jump of a bridge to end their life, the idea of say accidentally falling off a bridge doesn’t bother them. They might think of ways they could end their life but have no intention of going through. The hurt is just so bad they think of ways they could escape. I honestly think Dan is dealing with some of this right now. He’s hurting for Diana, but he’s also hurting for himself. If she actually died, he might consider following her. 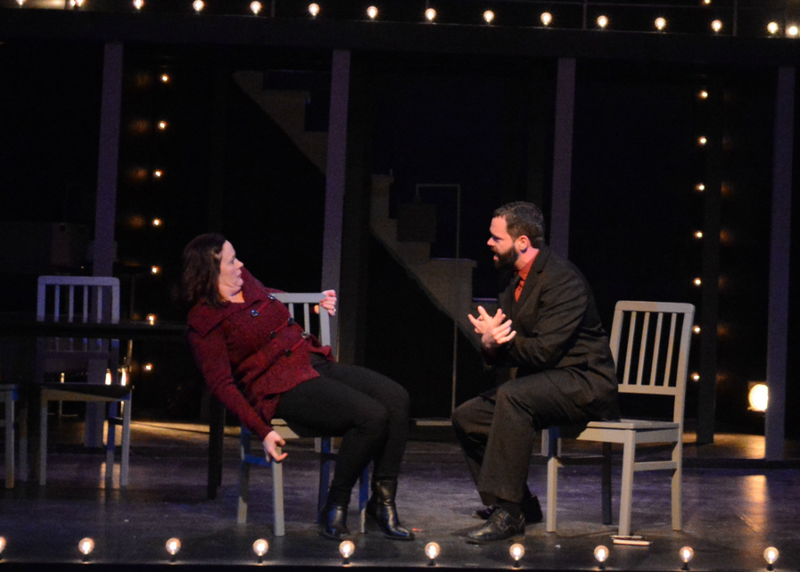 Act 2 opens with Diana receiving ECT treatment for a couple weeks, in hopes that it will help her Bipolar disorder and hallucinations of her son. It has some positive effect, but also greatly kills her memory. It’s a little bit later into Act 2 when Diana asks Dan “Why Stay?”, when Dan shows his resolve as to being a loving husband and always being there. I cannot state how important this is for someone with mental illness. I’ve had a couple people in my life who have stayed by my side no matter what and always having someone there means a lot. Not leaving no matter how bad it gets or how down on myself I get. Dan’s resilience here is amazing. When the medication and treatment failed to work, we see Diana start to question why she is like this. For someone who suffers, especially for a long time, this is true. It’s also something I’ve been through and still struggle with. You wonder what if I’m just this broken? What if I’ll be like this forever? What if it’s my fault? You can’t help but think nothing will help you, and you might just be permanently broken. It’s a really hopeless and helpless feeling and you honestly feel like you’re resigned to be sick and broken forever and nothing will help. As I said earlier I’m struggling with medication dosages and finding something that works so I personally have had to deal with a lot of feelings like this. Shortly after this we see one of the first real conversations Diana and Natalie have had. I talked in “Superboy and the Invisible Girl” how it was making Natalie feel isolated, but now we see them actually talking. However, even after all this Diana still ends up needing to leave. This can also be a real thing for someone with mental illness. Not that I’ve necessarily needed to leave my family and go live my myself. However, there have been friendships, or things in my life that have taken breaks since I started suffering. I’ve even had times where I took a few days off of my duties from ATB because I needed some space and time. It doesn’t even have to be a physical thing like Diana did. However, that physical thing is so symbolic of what people who suffer might need to do sometimes. It’s also when Diana leaves we get a big moment for Dan again as well. Earlier we talked about how Gabe would follow people around the stage as a constant reminder of what is going on with Diana and what is hurting this family. Here we see Gabe sitting beside Dan, and eventually, Dan finally says his name. It’s the first time Dan has truly acknowledged Gabe’s presence in the house, and what happened. We saw earlier in the show that Dan wouldn’t even say his name and now he died. This isn’t as relatable obviously, however, most people who suffer do have something they need to acknowledge. For my early on it was hard to acknowledge that I was having panic attacks and did have anxiety. It was hard to acknowledge I needed help. A lot of people have something that’s just constantly lingering around them that they need to name and get help for. Whether it be like in the case of Next to Normal the death of someone, or for some people it might be an addiction, or just that they refuse to get help for depression or anxiety. It can be so hard to admit there is something like that lingering but it is also so important. This is now the end of the show where it ends on a happy note of “Light” I personally like that they ended on a hopeful note but also left he ending up for interpretation. In the finale I see Diana coming home to her loving husband, but beyond that we don’t know what happens to each character which I like. It’s also true for anyone who suffers. You can have that optimism but at the same time you don’t know where it will take you. That door is wide open. Overall, Next to Normal is a very heartfelt show that is so relatable to people who deal with any sort of mental illness. To seeing how Gabe follows around members of the family, to seeing the relationship Dan and Diana have. There is at least something in this show that many people who suffer can relate to. I hope I helped shed a light on some of that. I obviously did not cover everything, as there is a lot to unpack in this show. I tried to keep it more to the parts that are relevant to my experiences, and what I can relate to. I hope that you enjoyed and that maybe you were able to gain some appreciation for both Next to Normal as a whole and those who suffer from mental illness. And to anyone reading this who like me does suffer. Keep hanging in there. Hopefully one day we too will be able to see the light.